May 2, 2016 – The University of Colorado Boulder will be part of a $7.3 million national initiative to develop a next generation space weather simulator capable of predicting energy distributions during space weather events like solar flares to an accuracy of one degree longitude and one degree latitude – about 100 km in each direction. The project is being led by physicists at The University of Texas at Arlington. Current estimates of the energy entering the upper atmosphere during times of greatest solar output can be off by as much as 100 percent. As a result, the models used to forecast trajectories and track satellites orbiting in a specific region can also yield an error of up to 30 percent, affecting the stability of GPS and communication systems. High-frequency radio waves, used in military, governmental and aviation communications, weather stations, maritime sea-to-shore services and distress communications and shortwave international and regional broadcasting, are also affected by the disturbances. The five-year project, funded by the Department of Defense through the Multidisciplinary University Research Initiative program, involves physicists from the University of California, Los Angeles; Johns Hopkins University; Massachusetts Institute of Technology; the University of Colorado at Boulder; University of New Mexico and the University of Texas at Dallas, as part of a team led by UTA. The project involves several phases of data analysis and assimilation, followed by model development and validation. In the first phase, measurements of electric and magnetic fields from low-flying spacecraft and ground-based remote sensing tools will be processed to define the intensity and distribution of energy in the upper atmosphere during both quiet and storm periods. According to the project, this data will then be compared with simulations from Yue Deng’s current Global Ionosphere-Thermosphere Model or GITM, which uses advanced computing to model energy redistributions in the upper atmosphere. Deng’s GITM will also be coupled with the Rice Convection Model from UCLA, with an aim to develop a more accurate global space weather simulator. Chaoqun Liu, UTA professor of Mathematics, and Mingwu Jin, UTA assistant professor of Physics, will apply innovative numerical modeling and data processing techniques to achieve high order accuracy and high resolution in the new system’s specifications. 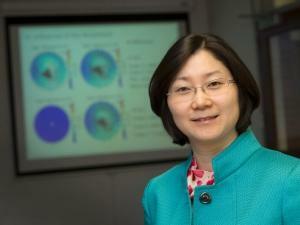 This research builds on Deng’s 2015 Air Force Office of Scientific Research grant of $378,350 to study space weather effects over the polar regions and two prior NASA grants totaling almost $1,000,000 that she won in 2013 and 2014 to study how energy from solar winds enters and moves around the upper atmosphere and how events affect vertical winds in the upper atmosphere. All three investigations are currently ongoing. Deng began to develop the Global Ionosphere-Thermosphere Model while she was a graduate student at the University of Michigan working with Aaron Ridley. The model differs from earlier systems in that it includes more processes, permitting a better understanding of upper atmosphere circulation, especially in regard to the vertical dynamics. Deng joined the College of Science in 2009. In 2010 she received a National Science Foundation Early Career Development Program grant, known as a CAREER grant, given to outstanding junior faculty who exemplify the role of teacher-scholars. Deng graduated from Peking University with a bachelor’s and master’s degree in space physics before moving to the United States to earn doctorate in space science at the University of Michigan.